Continuing with the critiques I started in 2015, here is the next in series – a book review. Recommendation: If you want an easy and quick murder mystery pick it up and you will enjoy it. 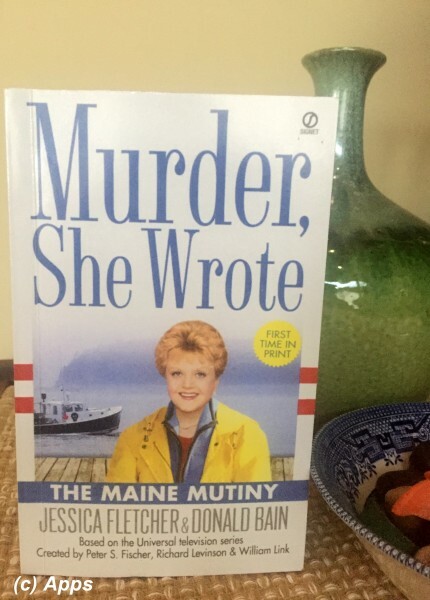 The Maine Mutiny is the 23rd book in the Murder, She Wrote series by Donald Bain and fictional writer Jessica Fletcher based on the popular TV Show of the same name. The book was published in April of 2005. This time the plot is set in her very own town of Cabot Cove, Maine. The town of Cabot Cove decides to have a Annual Lobster Festival to promote their main street and help boost the businesses there, and also perhaps start a new tradition. The activities preparing for the festival are progressing in full-steam. But the hiccup was the lobstermen itself. They are tight-lipped when anyone is approaching them with the hopes of writing up an article about them in the Cabot Cove Gazette for the festival. Lincoln "Linc" Williams, the head of the local lobstermen's association who thinks himself as a man of great importance and so do his fellow lobstermen, takes a stance not to speak for the article. So Jessica takes up the task to help Gwen and hoping that the lobstermen would be more keen to talk to a long-time resident as opposed to a new person. Promptly she seeks out Mary Carver to ask her husband Levi Carver to talk to Linc Williams about the article. But then the troubles start as the lobstermen feel they are being cheated by holding off the catch for the festival. The catch is low in number comparatively and the prices are up. However, Henry Pettie - the loan shark and the dealer for the lobsters - is taking this chance to make profits by paying the lobstermen lesser money than promised. Spencer Durkee had signed the agreement between the Chamber of Commerce and the Dealer, representing the Lobstermen Association. Some of the lobstermen are angry with Spencer for being the representee and give him trouble with his boat. Then Ike Bower gets his share of trouble the day after he voices out that Pettie was cheating them. Someone is trying really hard to ensure that the lobstermen don’t go on their own and stick to Hettie. Is that Linc? Does he want to stay as a president and rule as a Hitler? Is he reaping any side-benefits from Pettie? The troubles for the lobstermen seem to increase and Jessica pokes her nose in unknowingly in the effort to help them. Then Barnaby Longshot gets beaten up badly around the time he was supposed to meet Jessica and tell her about the trouble that Ike had. The same night after Barnaby was taken to hospital Jessica sees someone going into Spencer's boat and she follows ending up in the boat hit on her head by someone. The plot comes to present time where it had originally began. The dead body that Jessica sees in the cabin is of Henry Pettie. Who killed Henry Pettie? Who had knocked her out? How will Jessica come back ashore with a boat that is practically not working? Will she be rescued? As always Dr. Seth Hazlitt and Sheriff Mort Metzger aid Jessica when she finds herself in a bind as the investigation proceeds along. The plot continues through quite a few surprising turns and eventually unravels the entire lobstermen mystery. As the plot thickens we get to meet a lot of interesting characters along the way - Gwen Anissina (event planner), Barnaby Longshot (a slow learner and does odd jobs for everyone around), Mayor Jim Shevlin, Roger Cherry (retd accountant, former president of chamber of commerce), David and Jim Ranieri (owned Charles Department Store), Evelyn Phillips (new editor to the Gazette), Matilda Watson (owner of The Cabot Co ve Gazette), Audrey Williams (wife of Linc Williams), Abigail Brown (a beauty peagent contestant that Evan Carver is interesting in), Ike Bower (another lobsterman), Brady Holland (another lobsterman and Linc Williams' nephew) and Alex Paynter (another lobsterman). This was one book that it took a while for me to get through, a slow read to start with. Perhaps a whole chapter about lobster trapping put me to sleep and perhaps I am not a fish person, but either way the plot proceeded very slow for me to read, unlike other books. Somewhere around the time I reached Chapter Ten I got hooked to the plot like with any good book and enjoyed the rest of the story thoroughly. 1) Jessica remembers the poem The Rime of the Ancient Mariner by Samuel Taylor Coolridge while stranded on the boat. How apt to match the scenario. 4) The author mentions about green lobsters….I always thought lobsters were orange or rather red. Never heard about green lobsters.